There are 72 preschool children between the ages of 2 years 9 months and 5 years old at Albany Children’s Center. 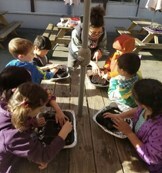 We have four preschool classrooms: Acorns, Eucalyptus, Oaks and Willows. This program is full day operating from 7:30 am – 6:00 pm. We are open 245 days a year. There are opportunities for families who are income eligible to receive subsidize child care services; we also offer a full cost program as well. 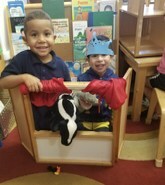 This preschool program is child-centered and play-based. 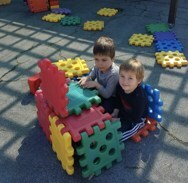 We utilize creative, emergent curriculum as our guide. We support children in their social/emotional, cognitive, motor, and language development. 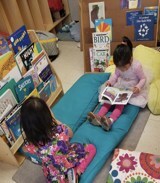 Each day the children are engaged in literacy through activities such as music, dance, and circle time. 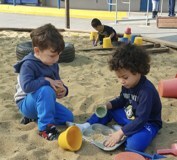 Our qualified staff help children develop a sense of self-worth while supporting their own individual learning styles. We have a large outdoor play area for children to explore, run, jump, climb, and ride bikes. We serve a hot, family-style lunch as well as breakfast and an afternoon snack. We offer a Special Day Class (SDC) for preschool children, with special rights, living in Albany. It is a half day program. For enrollment information please contact Special Education services at 510-559-6536.